I love their enthusiasm. I get it! It’s freeing to realize that you don’t need so much “stuff”. And removing this excess from your home and your life…a weight lifts off of your chest. 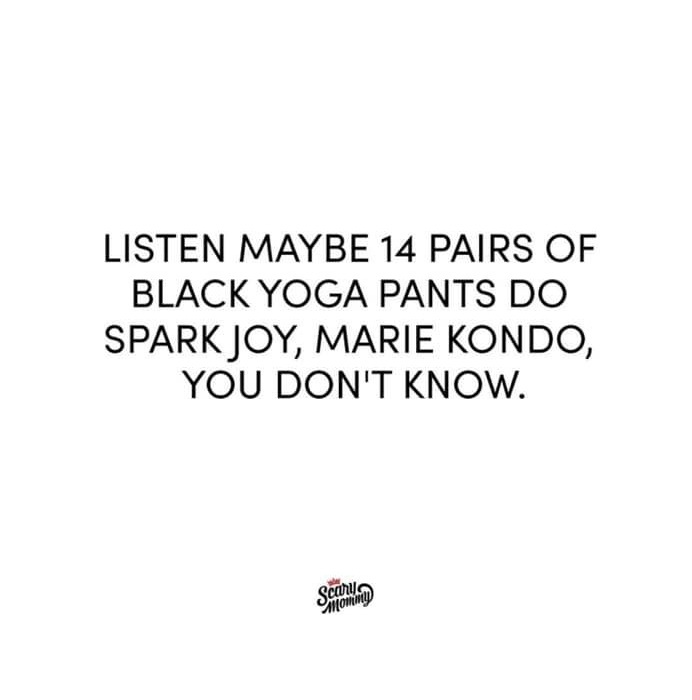 My family dove headfirst into the Kon Mari method on New Year’s Day 2016, two years after Marie Kondo released her hit title, “The Life Changing Magic of Tidying Up.” I downloaded the Audible Book and got started immediately. Like WHILE I was listening. My husband and I had always stayed on top of our kids’ toy situation, but I didn’t consider all of the things I was cramming into my kitchen cabinets and throwing into our storage space. Despite our home being on the small side, we have tons of closet space. It’s really amazing how clean a home can look, but be stuffed to the gills with unnecessary STUFF. Marie’s method requires you to take out EVERY SINGLE ITEM from each category and place it in a pile in the middle of the room. From there, you’ll hold each item in your hands and determine if it “sparks joy.” If not, you thank the item for its service in your life and gently add it to your discard pile. I teach a VERY MODIFIED technique in my Closet Cleanout Class and when I meet clients for Closet Therapy. If you’re stuck, I can help! So, what exactly do you need to begin your Tidying? Well, it’s less than you think! I recommend these products to help make the process easier. Some of these are affiliate links. I will earn a commission if you purchase items from these links. 1) Contractor Garbage Bags If you are really serious about removing TONS of stuff, don’t mess around with small garbage bags, Trader Joe’s bags, or assorted Amazon boxes. Fill up these bad boys and then post that pic on your fave social media outlet to show off how many bags you’re donating. 2) Non-slip Velvet Hangers When you put those joyful clothing items back in your closet, the ONLY way to hang them is on beautiful matching hangers. 3) Shoe Boxes How you store everything really depends on what you have and how your closet it set up. I love using these clear boxes to store and protect my favorite fancy or out-of-season shoes. 4) Drawer Dividers Inside of your kitchen drawers, you’ll want to store all of the like items together. The best way to keep them neat (and to encourage your kiddos to help put things away) is to have special places for every type of item. 5) Time and family buy-in You CAN tidy in small chunks of time spread out between all of your other obligations. But will you? And will it energize you or deplete you? And you CAN do it all by yourself. But, if you and your entire family are able to dedicate extended periods of time over the course of a week or a few weekends to this job, your results will be more dramatic and sustainable. It’s #worthit. If you need help creating a Capsule Wardrobe that works for you, check out my free Wardrobe Essentials Style Guide.